NUS Kent Ridge Campus | JustRunLah! Challenge yourself at the hills. Many of us are familiar with the campus from our student years. Located in southwest Singapore, Kent Ridge, is the main campus National University of Singapore with an area of approximately 1.83 km2. It is easily accessible by either transportation (see below for details) or via the Southern Ridges park connector. 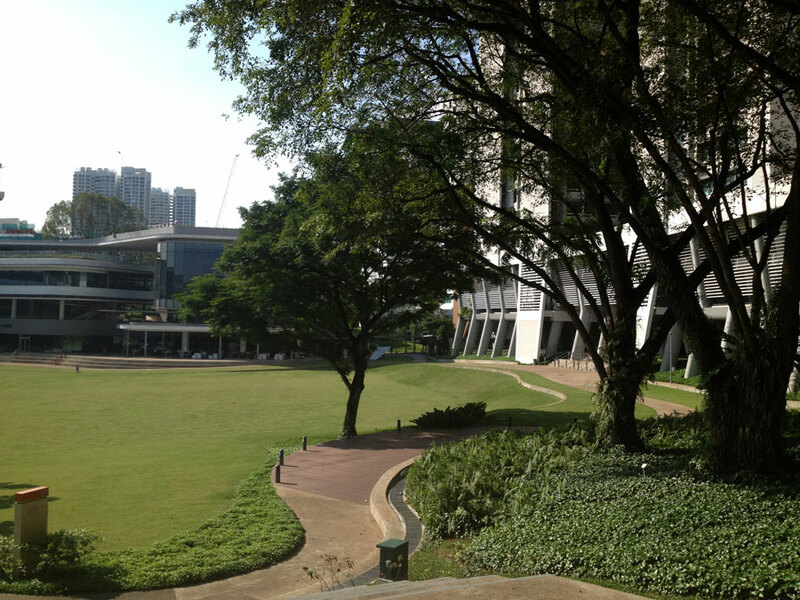 You can also include the campus in your run if you are coming from West Coast park. Even though some parts of the campus are flat, be prepared for a challenging, hilly morphology. Prince George’s road and Kent Ridge road are especially steep, on the south side of the campus. On the northern side – near AYE – the Sports and Recreation Center can be found. The fields and track are ideal for those who want to add a bit of speedwork to their runs. 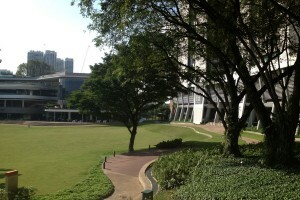 The new part of the campus, UTown, is connected via a flyer and it is suitable for running; it is also a great place to rest and catch your breath. Avoid running in the campus at the peak hours as traffic might get a bit heavy, but other than that there are minimum distractions by cars and the roads are lit. There are many parking lots around the campus. Visitors may park their vehicles in WHITE coloured lots at the pay car parks at the rate of 2 cents per minute. All red coloured parking lots are strictly reserved for staff holding the appropriate NUS season passes. There are various hydration points around the campus, such as near the Sports and Recreation Centre and the Central Library. If you are taking the train, the nearest MRT station is Kent Ridge (CC24). Dover (EW22) station is also near-by. If you are coming by bus, services No. 95, 96, 151 operate within the campus. Additionally, you can reach campus fringes by alighting at Kent Ridge Bus Terminal (SBST Transit Services No. 10, 33, 95, 151, 151E, 200 / SMRT Services No. 189), Along Clementi Road (SBST Transit Services No. 33, 96, 183 / SMRT Services No. 188, Along Ayer Rajah Expressway (SBST Transit Services No. 97, 197, 198, SMRT Services No. 963, Along Buona Vista Flyover (SBST Transit Services No. 97, 197 / SMRT Services No. 963), Along Pasir Panjang Road (near Heng Mui Keng Terrace)	(SBST Transit Services No. 10, 30, 51, 143, 183, 200 / SMRT Services No. 188). There are shower and toilet facilities near the Sports and Recreation Centre.